Junior Sydnie Stilley spent much of her teenage years battling leukemia at Children's Hospital and Medical Center in Omaha. Now she is a member of Dance Marathon to raise money for the hospital. As a 16-year-old, Sydnie Stilley’s life was punctuated by rounds of chemotherapy and hospital stays at Children’s Hospital and Medical Center in Omaha. Her energy zapped and her immune system weakened by her battle with leukemia, hanging out with other teens was a special occasion, rather than a normal part of day-to-day life. One of those special occasions was attending the University of Nebraska-Lincoln’s HuskerThon, an event put together by the university’s Dance Marathon group. Dance Marathon is a national organization with chapters at colleges and high schools, and each chapter raises money for its local children’s hospital. The organization also pays regular visits to the hospital, which is how Stilley was invited to a HuskerThon as one of its designated Miracle Children. 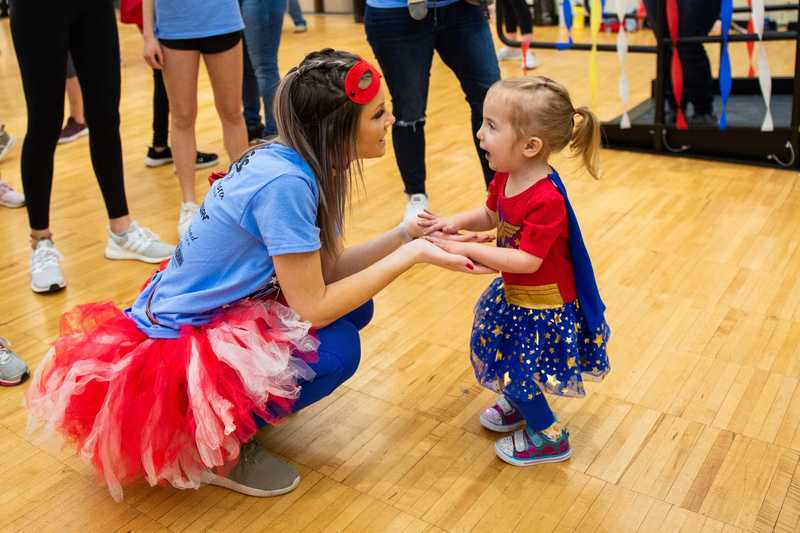 A University of Nebraska-Lincoln student interacts with a patient from Children's Hospital and Medical Center at the 2019 HuskerThon. Stilley remembers that first HuskerThon well. After a full day of socializing in the family room and watching the dancers bust a move, she was able to see how many people cared about Children’s Hospital, which had become her second home. It was also a chance to take a break from her hospital room and spend the day with students close to her own age. A day focused around dance sounded especially right to her, as she'd danced competitively before becoming ill.
Stilley, now in remission, enrolled at Nebraska in 2016. She participated in her first HuskerThon as a student rather than a patient, and it’s one of her favorite college memories. Every year since, she’s danced for the kids in attendance, for the kids she met as a fellow patient, and for the kids still at Children’s Hospital. “The fact that you don't sit down or rest or anything for 12 hours, it just kind of makes you feel half of what some of the kids feel, with the tiredness and the no energy afterward,” Stilley said. Now a junior studying pre-nursing – another choice influenced by her experience – Stilley is even more active in Dance Marathon and giving back to the hospital that helped her get well. She served on the fundraising committee for the Feb. 16 HuskerThon, which raised a total of $203,265. The money has been earmarked for the new emergency wing and triage rooms at Children’s Hospital. This year’s event had about 500 student dancers, said Jenni Brost, Dance Marathon advisor and interim director for New Student Enrollment. Whenever Stilley meets a parent or patient through Dance Marathon, she knows that she shares a special bond with them. “It’s nice to have that connection in that way," she said, "that they know what you've gone through and you know what they're going through right now." Students celebrate raising more than $200,00 for Children's Hospital and Medical Center.